I was asked to be a part of a team to support a consumer insights campaign for Shoe Carnival. I have been compensated by Ignite Social Media for Shoe Carnival. All views are my own. I was asked to visit Shoe Carnival this weekend and check out their Shoe Perks reward program. As the wise supermodel Naomi Campbell once said, "shoes never make you feel fat or ugly." I heartily concur. It's not hard to get me to shop for shoes. Situated between an office supply retailer and a liquor store in a busy strip mall, my local Shoe Carnival is only a few miles from my home. Roo accompanied me on my excursion, in the hopes that I would buy her some new shoes, too. The front of the store is filled with super crazy deals and low prices. It's easy to find your size in the stacks of boxes. Moving back deeper into the store, you find more brand name bargains. Roo's been pretty obsessed with the newly hip Sperry Topsiders. I tried some on and discovered that they are still not me, some twenty odd years later. Roo wanted to try EVERYTHING on. Seriously. My nine year old has outgrown the kids department. Yikes! 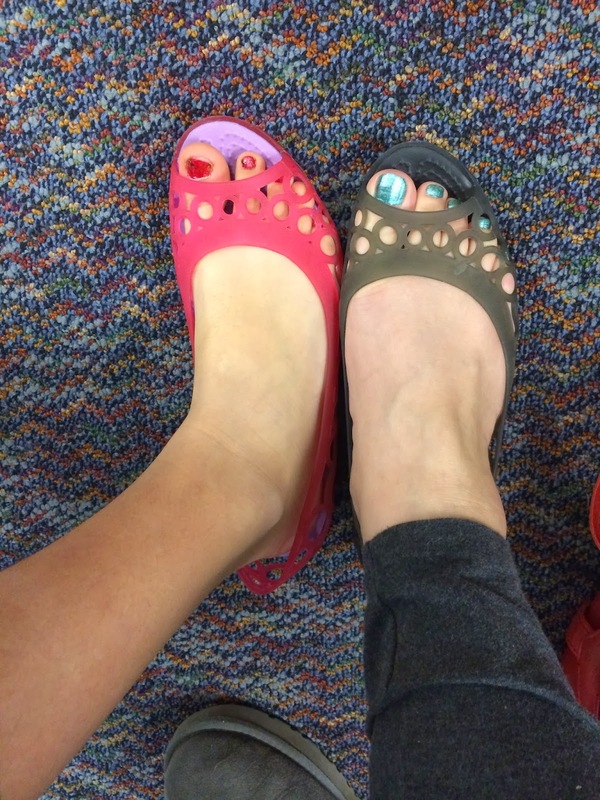 We tried on mommy-daughter Croc jellies. Yes, more '80s fashion redux. Can you tell whose feet are whose? There were a ton of cute bootie options. I seriously considered getting a pair of these Blowfish hidden wedges. And then my pesky daughter reminded me that I have the same style in almost exactly the same color. "But they're twill and these are tweed!" I argued. And then Roo gave me THE LOOK. So I pouted. I thought these tooled leather clogs were pretty cool but not my style. Still, can't beat that price. So then we got into the athletic shoes and I admitted to myself that I probably needed a new pair. There are a staggering number of choices, in prices ranging from super cheap through moderately pricey but still a good deal. I don't think I saw anything over $80, even for the newest, flashiest kicks. Roo liked all of the ones with bizarro spring soles and tie dyed neon colorways. I was a bit overwhelmed and tried on half a dozen pairs. While I was debating over sizes and styles of newfangled sneakers, Roo was thrilled to discover a basketball cage. She shot some hoops while I considered the value of aerated soles and thermal foam insoles. It was kind of hard to resist the manager who kept touting a limited time boot sale over the store intercom but I held firm to my quest and ended up picking a pair of Adidas that were $20 off the marked price. They were such a good deal that I let Roo pick out a pair of New Balance that were on super clearance for $25 and some multicolored socks. She was excited about the Spin to Win wheel by the registers, where you can get an additional discount or free prize. Another way Shoe Carnival helps to save money is their Shoe Perks Reward Club. You earn points for every purchase and when you accrue 200 points, you receive a $10 off reward certificate to use in store. I can imagine they add up fast, especially since you get 50 free points just for signing up!